wood frame structure on trailer, 170 sq. ft.
Lululiving is a 170 sq. 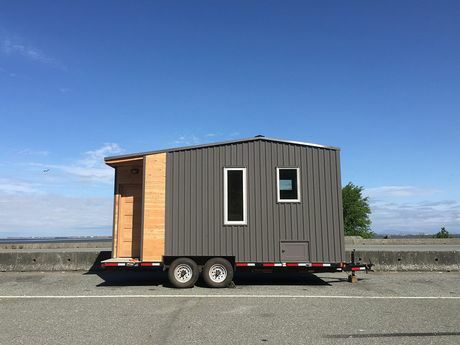 ft. wood-frame micro dwelling on wheels is an example of a fully serviced micro dwelling that can easily switch between connection to standard city services or off-grid placement. With its clean, high-ceilinged, open layout and a custom sofa bed, it easily converts between work space and sleeping. The split-level layout visually separates the kitchen and WC from the living area, stacking these above a storage and service area. Space is used efficiently, with many built-in and convertible storage details. On the exterior, durable metal cladding and windows on three sides of the structure continue the efficient character, while the entry area features elegant fir siding. The small porch creates a private transition area within the footprint of the house. The structure is built to residential wood-frame house standards. It is prepared to switch between a 120V household electrical feed and off-grid solar or generator power. Energy-efficient LED lighting is used throughout. A 30-gallon fresh water tank and small water heater is located in the service area. The room heater and cooktop use propane. With the use of a composting toilet, there is only grey water waste, which is either stored in the portable grey water tank or piped directly to a sewer connection. Solo Exhibitions: Richmond Art Gallery, Home Made Home, 2018. Solo Exhibitions: Evergreen Cultural Centre, Home Made Home, 2018. Reviews, Articles & Essays: Annabel Vaughan, Home Made Home: a Game Changer, 2018.